Mumbai: This could be the Jio moment for India’s Rs22 trillion mutual funds industry. Asset management companies, which have as many as 18 million investors, are about to get a distributor in Paytm, which boasts of a customer base that is more than 16 times bigger. 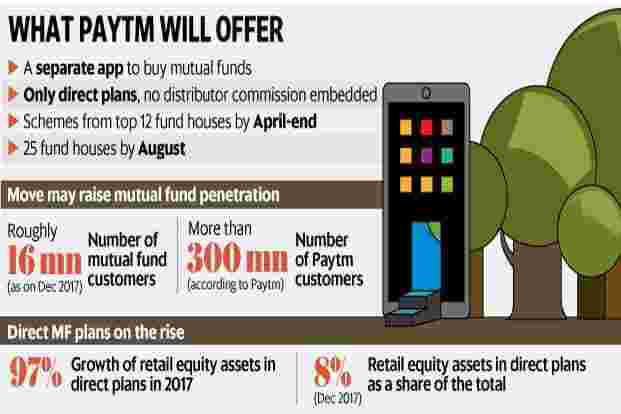 Paytm, which claims to have a user base of more than 300 million, is set to kick off its mutual funds distribution business with the launch of its digital platform by the end of April. Its new Android and iOS apps will offer investors mutual funds from 12 of the 15 largest asset management companies in the first phase. By August, it aims to increase that to around 25 fund houses. The distribution will be done through Paytm Money, the new wealth management unit of One97 Communications Ltd, which also owns Paytm, one of India’s largest mobile wallets, and Paytm Payments Bank. Paytm aims to emulate the success of Reliance Jio, whose entry shook up India’s telecom market, in the mutual fund distribution business. Nearly half of Paytm’s transactions occur in small towns. According to the Association of Mutual Funds of India, only 28% of individual investors’ assets in mutual funds come from “B15", or “beyond the top 15", towns, as of February, up from 25% in 2017. Paytm will sell only direct plans, which come with lower expense ratios as they do not have embedded distributor commissions. Originally meant for investors who wished to invest directly without the help of a distributor, a direct plan can now be offered by an investment adviser who is registered with the Securities and Exchange Board of India (Sebi). Paytm Money is a Sebi-registered investment adviser. Pravin Jadhav, chief executive of Paytm Money, said in an interview that investors would not be charged anything to begin with. “Investments via Paytm Money will be free from any commissions or fees or any hidden charges until a certain threshold; beyond this investment limit, Paytm Money is considering options to include a very small transaction or subscription fee for its investment platform," said Jadhav. He did not provide more details. The question is, will Paytm be able to bring in new investors into mutual funds or is it just a shopping mall for commodities and little else? Industry experts say Paytm will help expand the market for the mutual funds industry. “As direct plans become more dominant and the role of technology goes up over time, Paytm will be able to take mutual funds to newer and newer people," said Sundeep Sikka, chief executive officer of Reliance Nippon Life Asset Management Ltd.